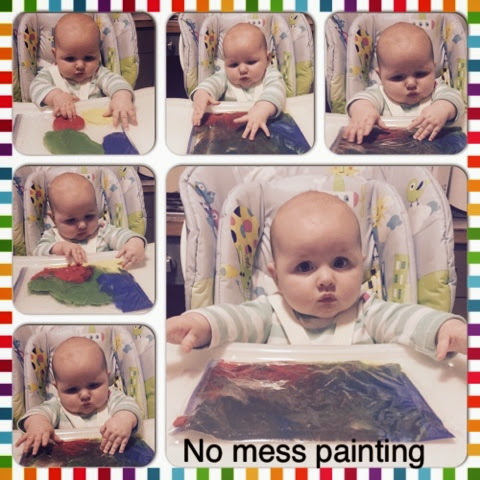 Baby Pebbles: Baby Activity: No Mess Painting! I've decided it's time to start making more effort to stimulate Penny as she's becoming much more alert and interested in the world around her. It's only right that I should let her explore new things and show her all the fun things she can do. Even at 6 months it's important to keep busy and enrich the mind. Before now I have interacted with Penny and we've done a few activities but nowhere near as often as I would like. My goal is to do some kind of activity with Penny every day whether she be doing it for 2 minutes or it keep her busy for 1 hour. The first activity we did was...No mess painting. I found this on the wonderful 'Pinterest', it's full of so many fun ideas for you and your baby to do and even as they grow up. All I did was buy some bright coloured paints, a zip lock bag and some celotape. Put the paints inside the bag into each corner a different colour. I did up the zip lock bad and added some celotape just to be extra cautious of no paint spillage. Then taped it to her high chair within reach of her little hands. Penny absolutely loved it, I always know when she's intriguied by something as she won't flash you a smile or even respond to me talking to her. She's to focused on what's in front of her. This kept her busy for a good 20 minutes, which I think is quite a while for a baby of 6 months. Once she was finished I just peeled off the tape and popped everything in the bin! It was as easy as that, and what a bonus no mass mess to clear up afterwards either. We will definitely be doing this activity again.